Children learn to read between kindergarten and 2nd grade through the teaching of caregivers and teachers. Even though children do not read on their own until kindergarten, early emergence of literacy can develop as early as 3 years old. Components of early literacy include exploring books independently, retelling stories, and letter recognition. 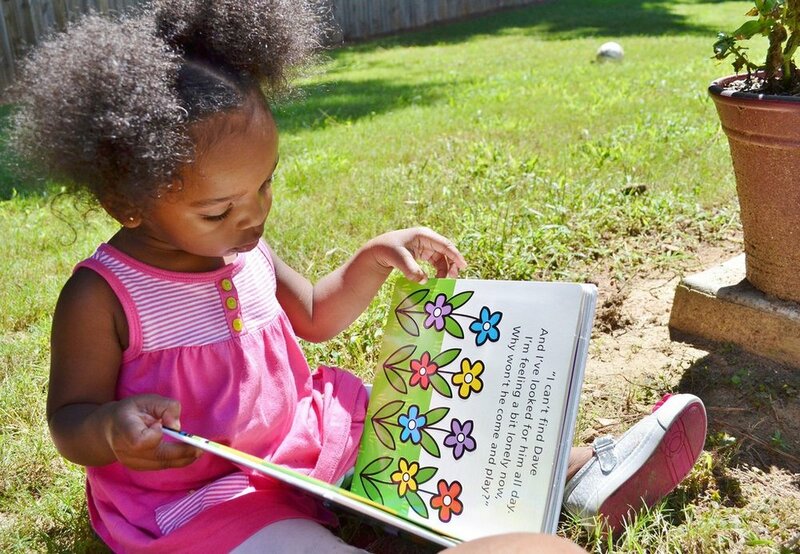 Here are some tips to help your child develop early literacy. - Point to words while reading. While reading books to your child, run your fingers across the words. Your child will realize that the letters on the page means something. If you pause on a word, keep your finger where you stopped. Engage your child by having them point to the words on each page! - Point out main words on each page. Show your child one important word on each page and have your child repeat the word. For example, in Goodnight Moon point out ‘goodnight’ on every page. Define the word, if it is not in their vocabulary yet. Pretty soon, he/she will be finding the word before you! - Identify words in the environment. Teach your child that words have significant meaning for communication. While texting a friend, have your child watch you text while reading aloud the words. While writing a birthday card, read aloud your note while writing. Have your child scribble on the card as their ‘signature’. Write out a grocery list together then your child can carry it during the grocery trip. Open a blank word document, and have your child practice typing on the keyboard. - Bring words to life with music. Songs and nursery rhymes can bring meaning to words in a fun way! While singing songs like “itsy bitsy spider” and “pat-a-cake”, children will learn new vocabulary words without being taught. If you have a nursery rhyme book, read the words in the book first, then sing the song on your own. Your child will see that the familiar song is written down in the book. Incorporate rhymes into play time. For example rhyme with your child’s name, “Kiley is so smiley!” Developmentally, your child will not be able to produce rhymes but they will be able to recognize. - Point out similar sounds. Set realistic goals for your child regarding reading. Do not pressure your child to start reading until they are ready. Read more about the importance of reading and tips to improve story time! Pepper, Jan, Elaine Weitzman, and H. Manolson Ayala. "Sharing Books." It Takes Two to Talk: A Practical Guide for Parents of Children with Language Delays. Toronto: Hanen Centre, 2004. 149-50. Print.